If you have ever taken guitar lessons but ended up quitting in frustration before learning to play guitar the way you want, you are not alone. The great majority of guitar players who take guitar lessons do not fully understand how to get the most out of their learning experience. Although it is true that most guitar teachers are NOT experts on how to teach others to play guitar, it is "even more true" that the vast majority of guitar students have ZERO clue on how to effectively learn to play guitar themselves. The good news is that while it may not be so easy to find the most effective guitar teacher, you CAN choose at any time to change your attitude and your approach to the experience of taking guitar lessons. Doing this will help you to make more progress in your guitar playing even with mediocre guitar teachers (and get exponentially greater results with GREAT guitar teachers). 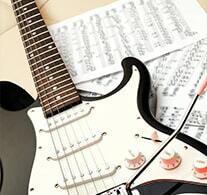 What you are about to learn will help you avoid the mistakes commonly made by guitar students who take guitar lessons and still have a hard time learning to play guitar the way they want. When you understand how to get the most from the experience of learning guitar with a guitar teacher, you will begin to improve your guitar playing faster than you ever have before. To get free instant access to this audio lesson, simply enter your name and email, then click the "Give Me Access Now" button to enter. All of your information is always kept 100% private and confidential.